We got some new coolers this time on the review block from a relatively new manufacturer. Bits Power just came onto the scene with their line of coolers. They have one P4 cooler available at the moment, but they also have two socket coolers on the market too. Aside from making heatsinks, they also make PC accessories like flash memory readers. They really strive towards the affordable route, which is a definite thumbs up from us at GideonTech. The two models that we will be reviewing are the NP60D and NP80D. Both are very similar, except the NP80D is larger and heavier. 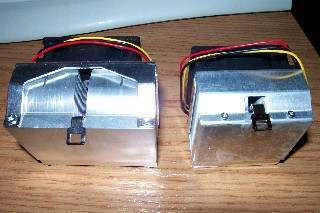 Both utilize the same fan and same clip design. Having seen so many copper units, its kind of refreshing to see a manufacturer still use regular aluminum. 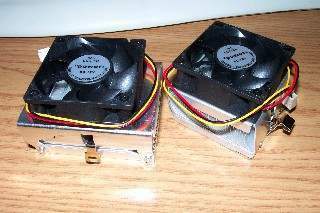 What sets these two units apart from other coolers is the odd shape of the heatsink fins. For a second, I thought this heatsink got clobbered on its way to us from Taiwan. After looking at Bits Power's website, it seems this is the way they are supposed to be. So I shot an email over to Vincent, our contact at Bits Power, and asked him what's the deal with this curved and tilted look. According to him, this is labeled as 'skiving technology', which creates more surface area for heat dissipation. Looks a little strange, but wouldn't making taller fins do the same trick? Anyway, I'm not the engineer, lets move on. The fins and the base are not attached, but molded together when the unit was created. 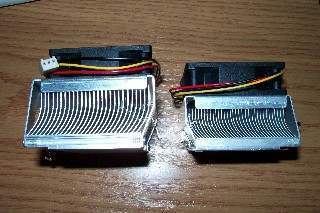 Some of our previous heatsinks had fins that were attached to the base by an interlocking design. This unit is just one large block of aluminum. There is a piece that covers the fins on both units. The NP80D on the left is slightly different in that there is an opening on this metal piece. 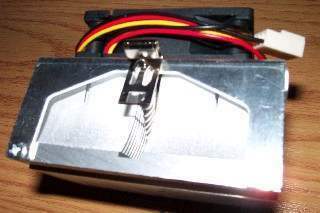 A lot of socket coolers nowadays use this metal shroud design to direct air flow through the fins. Seems to work nicely on most of them, not a surprise it is used here.